[S1145] E-mail from Diane Anderson to Stuart & Teresa Pask dated 25 April 2005. [S384] Website FamilySearch Internet (http://www.familysearch.org) : Parents: George W. PASK and Hegea BOYERS. [S384] Website FamilySearch Internet (http://www.familysearch.org) : Parents: George W. PASK and Keziah ROYER. On August 13 1862, when 24, Joseph enlisted in the 3rd Wisconsin Cavalry, Company D. The Third Cavalry spent most of its time travelling in Missouri, Kansas, Arkansas and some of the Indian territories, trying to defeat any Confederate forces in those areas. They scouted and served on guard duty, and fought in what was described as "guerilla warfare." Joseph G. Pask died at his home near Osseo, Mich., June 18, two days after his 92nd birthday. He was born in Lincolnshire, England and came with his parents to America when he was a lad of six years. The family settled in Richland county, afterwards coming to Defiance county, where he lived south of the Chickasaw for many years and where his four children, three daughters and one son were born. Several years ago, he moved to his Michigan home where he died. 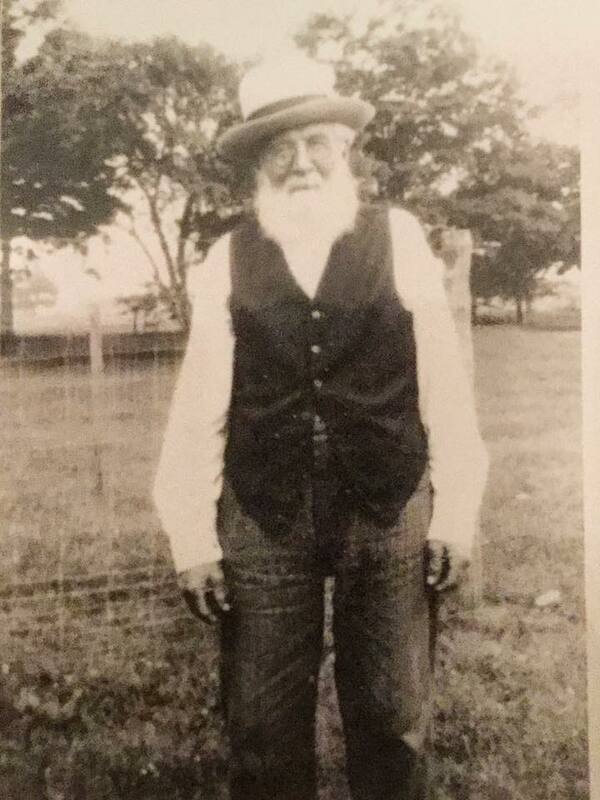 Mr. Pask served through the Civil war, enlisting in 1862 at Madison, Wis., and serving until the end of the war. Mrs. Field feels very grateful to the friends and neighbors at his Michigan home and also of his former home around Farmer for their many kindnesses during his death and burial. [S2] GRO Indexes to Births. "1838/Q2 PASK, Joseph George Sleaford 14 500." Photograph & Information from Cindy Moore, dated 22 March 2017. [S5716] Website Facebook Group: Pask Family History: Information from Jules Wallace Pask via Messenger on 20 August 2017. Information kindly provided by Dianne. [S5002] Website Ancestry: Year: 1870; Census Place: Washington, Defiance, Ohio; Roll: M593_1195; Page: 194B; Image: 316908; Family History Library Film: 552694. [S1259] Website FamilySearch Internet (http://www.familysearch.org) : Washington, Defiance, Ohio Family History Library Film 1255011 NA Film Number T9-1011 Page Number 242A. [S5002] Website Ancestry: Year: 1880; Census Place: Washington, Defiance, Ohio; Roll: 1011; Family History Film: 1255011; Page: 242A; Enumeration District: 241; Image: 0708. [S5002] Website Ancestry: Year: 1900; Census Place: Washington, Defiance, Ohio; Roll: 1263; Page: 14B; Enumeration District: 0019; FHL microfilm: 1241263. Photograph & Information from Cindy Moore, dated 15 March 2017. Photograph & Information from Cindy Moore, dated 14 March 2017. Photograph & Information from Cindy Moore, dated 17 February 2017. [S3336] Website Find A Grave: Find A Grave Memorial# 144078420. [S5001] Website Ancestry: Ancestry.com. Michigan, Death Records, 1867-1950 [database on-line]. Provo, UT, USA: Ancestry.com Operations, Inc., 2015. [S3736] Website FamilySearch Internet (http://fsbeta.familysearch.org: ) Name Rosa Ann Mason Death date 23 Jan 1941 Death place Marshall, West Virginia Marital status Married Spouse name Frank P. Mason Father name Joseph George Pask Mother name Sarah Elizabeth Reed Film number 1983558 Digital GS number 4259837 Image number 782 Reference number 762 Source Statewide. [S384] Website FamilySearch Internet (http://www.familysearch.org) : Batch M514071. [S3336] Website Find A Grave: Find A Grave Memorial# 144078441 - shows her date of birth as 16 June 1848. [S3336] Website Find A Grave: Find A Grave Memorial# 144078441. [S384] Website FamilySearch Internet (http://www.familysearch.org) : Batch M514072. [S3336] Website Find A Grave: Find A Grave Memorial# 155817493. [S5002] Website Ancestry: Year: 1900; Census Place: Farmer, Defiance, Ohio; Roll: 1263; Page: 1A; Enumeration District: 0010; FHL microfilm: 1241263. [S3336] Website Find A Grave: Find A Grave Memorial# 155817484. Photograph & Information from Mark Strand, dated 4 April 2017. [S5002] Website Ancestry: Year: 1930; Census Place: Bryan, Williams, Ohio; Roll: 1891; Page: 7A; Enumeration District: 0016; Image: 283.0; FHL microfilm: 2341625. [S5002] Website Ancestry: Year: 1940; Census Place: Glen Dale, Marshall, West Virginia; Roll: T627_4426; Page: 14A; Enumeration District: 26-34. [S3336] Website Find A Grave: Find A Grave Memorial# 155817505. [S3336] Website Find A Grave: Find A Grave Memorial# 144180359.